The Amundsen-Scott South Pole Station is located at an elevation of 2,850 m on the 3,200 m thick polar plateau, a field of ice and snow that is moving toward the ocean at a rate of 10 m per year. The elevated station must be jacked up during its lifetime to accommodate the increasing snow level around it. The elevated station is designed to be raised twice by a full story height. The existing Amundsen-Scott South Pole Station is located primarily on the snow surface and is the only relief for many kilometers. A substantial effort is necessary each year to move drifted snow to maintain access to the facilities. Therefore, the decision was made to elevate the major parts of the new station and shape it in a way to enhance airflow under the facility. Snowdrift studies by Rowan Williams Davies and Irwin, of Guelph, Ontario, determined that the surrounding snow could accumulate several meters above the bottom of the station and the wind would still maintain clearance under and around the elevated station. The elevated station will consist of two two-story, C-shaped pods separated by 12 m with a two-story connecting link between them. Each pod is made up of four modules: the two modules at the front of the pod form the body of the C, the two others are the legs of the C. The front modules are oriented toward the prevailing wind with a sloped bottom edge to enhance airflow. A fabric wind deflector is located in front of the connecting link to mimic the wind shape of the front modules. The two front modules are each 27.4 m wide by 14.9 m deep, and the back legs of the C are each 11.6 m wide and 30.3 m long. The vertical tower and a surface passageway connect the elevated station to the facilities on the snow surface. Most current facilities on the surface are enclosed in corrugated steel arches that shield them from wind and drifting snow. The ambient temperature within the arches is that of the snow pack, which is approximately -50ºC. To determine the anticipated overall settlement of the snow under the elevated station over a 50-year period, the analysis looked at the snow for a depth of 30 m under the foundations. Formulas and information from Malcolm Mellor and Rene Ramseier were used for this analysis. The snow properties were normalized for snow at -10oC. Adjusting the modulus of elasticity for snow at -50oC increases it by approximately 10 percent. The analysis was done by dividing the snow into 1.5 m layers of a uniform density, since snow properties depend markedly on density. At five-year intervals the density of the layers was adjusted and the analysis continued. The settlement was evaluated for the snow mass both with and without the building. The foundation bearing pressures used for these analyses are 48 and 24 kPa. Those pressures were distributed out in the depth of the snow at an angle of six vertical to one horizontal. Without the building the settlement over 50 years is approximately 840 mm. With a foundation bearing pressure of 48 kPa the settlement is approximately 990 mm. This gives an increase of 150 mm in overall settlement with the added weight of the structure. With a foundation bearing pressure of 24 kPa the settlement was reduced only by approximately 20 mm. Although the analysis indicates that the variability of bearing pressures has only a nominal effect on settlement, footing widths were based on keeping long-term bearing pressures uniform. Since distortion of the ice field is not a concern, it was determined that the best approach would be to leave the footings buried in the accumulating snow and jack the building on top of the foundations. This simplifies the raising of the buildings since they can be jacked on the main foundations. To account for variability in the snow properties, the 150 mm of predicted additional settlement was increased by 100 percent, to 300 mm. For soils, differential settlement is normally taken to be half the total settlement, and this seemed a reasonable guideline to use for snow as well. This gives a design differential settlement of 150 mm over the life of the elevated station. The settlement analysis included the development of a uniform snow pad beneath the elevated station. This pad will be excavated and uniformly compacted to a density of 0.55 to 0.60 g/cm3. This accomplishes two things: First, the variability of the snow density in the station footprint that has developed from airplane and vehicle traffic is eliminated. Second, the less dense snow in the footprint is worked to a higher density to minimize overall settlement and differential settlement. The snow pad is developed by backfilling snow in 300 mm lifts and driving over it with front-end loaders. It is somewhat of an art because if the snow is worked too much the snow crystals lose their points and the snow becomes less workable. Additionally, the building pad is built up 1.8 m above the existing snow level to the bottom of the footings to give a head start on snow accumulation. This pushes the first jacking of the station another 10 years beyond the time it would have been done if the foundations were at existing grade. The maximum design foundation bearing pressure for long-term loads, dead loads plus a portion of the live load, is 48 kPa. The maximum design foundation bearing pressure for full loads is 96 kPa. This approach is taken because the foundation bearing pressures are settlement critical, and only the long-term loads have an effect on settlement. This is similar to the approach used for freeze-back piles in ice-rich soils, where the long-term creep of ice is the critical factor. If distortion of the ice field were a concern, it would be necessary to raise the buildings by supporting them on temporary foundations. Then the main foundations would be excavated, raised, and reset to correct for distortion in the ice field. However, since distortion of the ice field is not a concern, it was determined that the best approach would be to leave the footings buried in the accumulating snow and jack the building on top of the foundations. This simplifies the raising of the buildings since they can be jacked on the main foundations. It also reduces the risk of establishing temporary foundations adjacent to the excavation for the main foundations, as well as the risk of making a major excavation under the elevated station. . This means the foundations need to be designed for the total differential settlement. Also, the lateral support for the superstructure must come from cantilevering the foundation columns since the building superstructure is released at the tops of the foundation columns to be leveled or jacked. Such a moment frame has the flexibility to accommodate differential movement, more so than a braced foundation. Any diagonal bracing or horizontal struts above the foundation would become buried in the snow and with time would fail from the weight of the compacting snow. Also, a braced foundation creates more members to interrupt the smooth flow of the wind under the elevated station. The foundation system used comprises a series of 710 mm high by 610 mm wide steel plate box girders acting as foundation-grade beams between the foundation columns from which the 910 mm diameter foundation columns are cantilevered. The grade beams provide the fixity at the base of the columns as well as distributing the vertical loads of the columns along the length of the grade beam. The grade beams also act much like a raft foundation system: They have the stiffness to distribute vertical loads along the grade beam if one area settles more than an adjacent area. This bridging ability to straddle soft areas also increases the bearing pressure on stiffer areas and gives the foundation self-leveling capabilities to limit differential settlement. 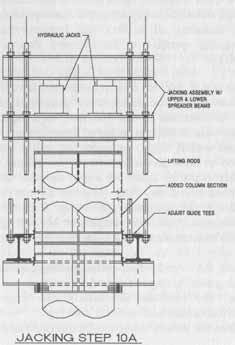 The grade beams extend beyond the columns to limit deflection at the top of the columns caused by rotation at their base. 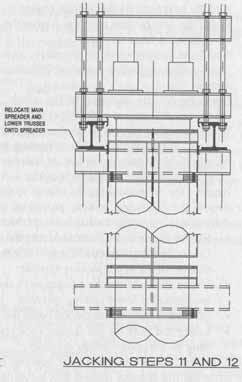 The box girders also have excellent weak-axis properties and torsional properties to give increased stiffness for settlement of perpendicular grade beams and give the overall foundation significant stiffness for any minor distortion of the ice field that may occur during the life of the elevated station. The base footing width is the 610 mm width of the grade beam. To keep the snow bearing pressures uniform, the footing is wider where the bearing load per meter is greater. The wider footing is 90 by 140 mm timbers on edge with plywood top and bottom. 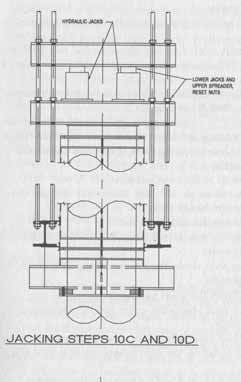 As the design developed the actual long-term bearing pressure on the snow became 34 kPa as established by the grade beam with the least vertical loads. 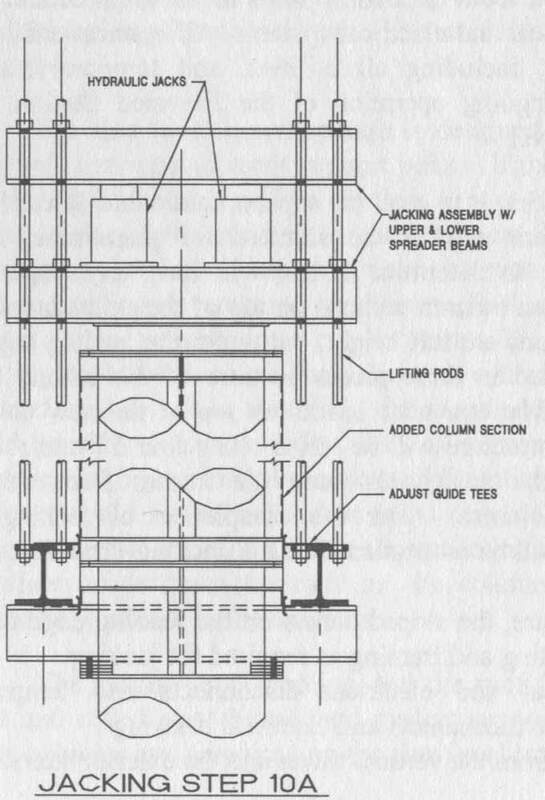 Jacking is accomplished by adding new column sections, typically one story high, on top of the existing columns, and raising the trusses to the top of the new column sections. Under the leading edge of the building the one-story lift will require three partial-height columns. Before jacking begins, determine if any truss-to-column locations need to be adjusted for plumbness and, if so, by how much. Fabricate the new column sections to take into account adjustments to make them level or plumb after the evaluation to ensure that the adjustment will not cause problems with the jacking structure. Jacking is effected either by raising the entire structure at one time or by raising separate pods in alternating increments of 10 in (254 mm). The guide tees provided stop the truss assembly from shifting away from it location on the column during jacking. The three-dimensional STAAD model, developed by Research Engineers International, of Yorba Linda, California, was used for the foundation system with the grade beams and foundation columns for an entire pod. 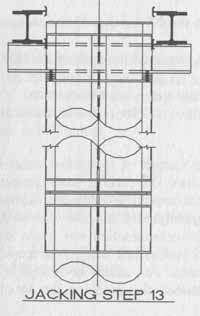 The grade beams are supported on a series of springs, which were selectively softened up to model the differential settlement of the snow. 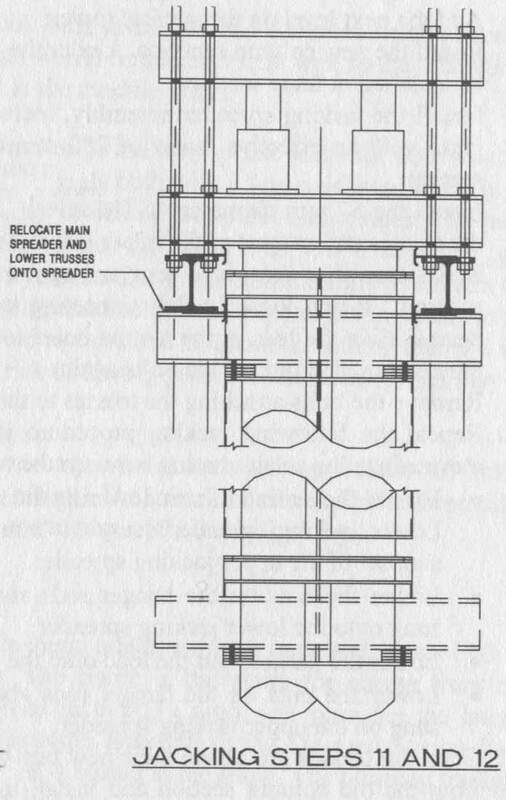 The model indicated that the beams were stiff enough that the design differential settlement was not actually reached. All of the foundation columns are outside of the building envelope to allow the addition of column extensions for jacking. At the beveled leading edge of each pod the foundation columns are outside of the first level but underneath the second level. The design was based on jacking the building twice, a full floor height of 3.7 m each time. So the initial column height of 5.3 m is designed to become 12.8 m at full height. All of the foundation columns are bolted in the field to the base grade beam section. All future column extensions will be bolted in the field. All field splices in the grade beams are bolted. The station superstructure is steel frame. At the first level the frame comprises a series of 1,220 mm deep trusses and open-web steel joists. At each pair of foundation columns the major trusses are supported on a pair of 1,220 mm deep trusses that straddle the foundation columns. These support trusses need to straddle the foundation columns to allow the column extensions for jacking to be placed atop the existing columns. These trusses extend outside of the building thermal envelope to reach the foundation columns, but typically the top of the column and the truss ends are within an additional insulated enclosure. This enclosure will be removed for leveling or jacking. The first-level superstructure is designed for a 50 mm maximum differential settlement between adjacent support points. If the differential settlement exceeds 50 mm the superstructure will be leveled. It is possible that operational concerns will require leveling with less differential settlement. Leveling is accomplished by raising or lowering the double support trusses at each foundation column with hydraulic jacks and adding or removing steel shims. Each support point is erected with 75 mm of steel shims, which allows a positive or negative adjustment of 75 mm at each column. Leveling could be done on one column at a time or several columns at a time. 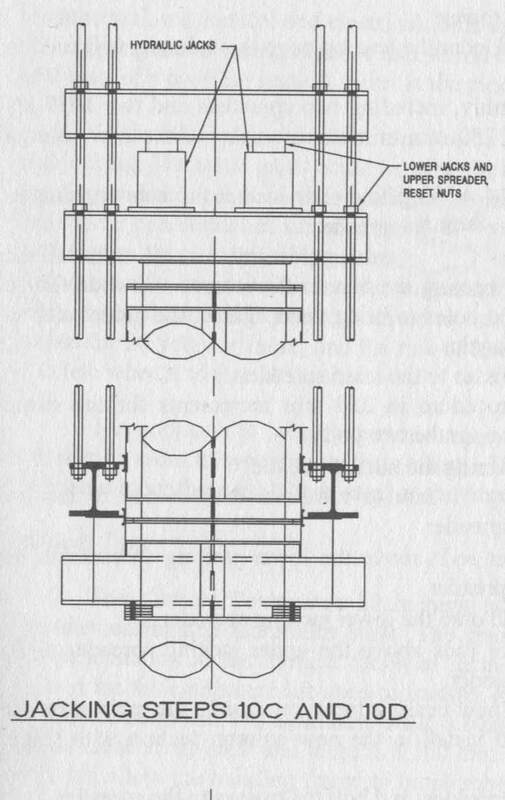 The elevated station would stay fully functional during this operation since the jacks would be able to accommodate the full vertical loads at each point, including an allowance for higher loads because of differential settlement. Also, if a jack failed the structure would settle back down to its original position so that no collapse could occur. At each foundation column the straddling trusses have guide tees on four sides that slide up or down tee rails on the columns so that the trusses do not shift horizontally relative to the columns. The second-level framing and the roof framing are a combination of steel joists and rolled steel beams and girders supported on wide-flange steel columns. These columns are supported on the first-level trusses. Moment-resisting steel frames made up of the columns and wide-flange beams or joists provide lateral support for these levels. Each floor is a wide-rib metal deck 38 mm deep sheathed with a fiber-reinforced board to provide a smooth surface. All steel in the elevated station is of the high-strength, ASTM A572 Gr. 50 type, except for the foundation columns, which, because of the possibility of vehicle impact, are low-temperature API5LX. All bolts within the building envelope are regular ASTM A325 or ASTM A490 high-strength bolts, and all bolts outside of the building envelope are ASTM A320 L7 low-temperature, high-strength bolts. To accommodate snow accumulation, the elevated station is designed to be jacked twice during its lifetime. A jacking procedure has been developed. Each time the elevated station will be jacked a full story height to match the floor elevations at the vertical tower. 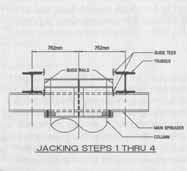 The jacking will occur in 250 mm increments, and each pod can be jacked concurrently or alternately in that increment. The connecting link is supported at the first level of each pod with a pinned joint. It is designed to accommodate up to 250 mm of elevation difference at its joints between the two pods with each pod with expansion joints both in its architectural skin and in its mechanical and electrical systems. All connections to the vertical tower will be removed, including all utilities, and temporary utility connections made to allow the ongoing operation of the elevated station. The vertical tower will be raised one level. 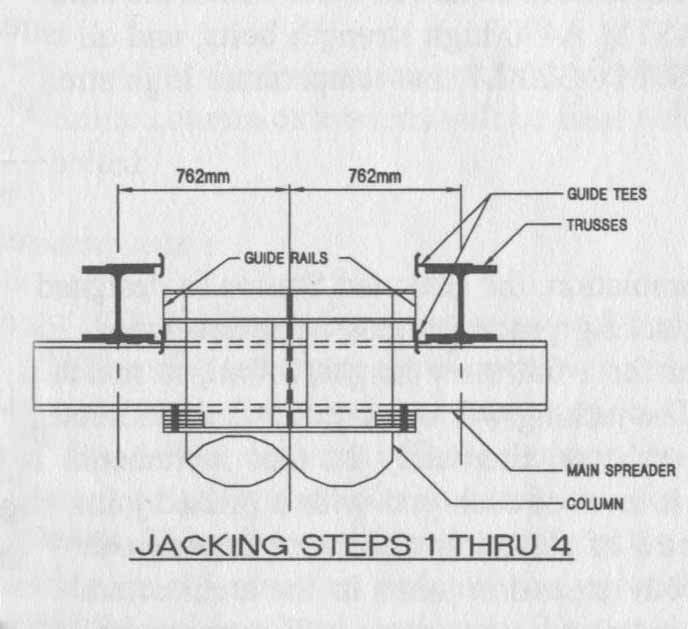 One of the first stages in jacking is to level the superstructure and determine if any of the new foundation columns need to be adjusted for plumbness. If so it will be necessary to determine how much and to establish if that will have any effect on jacking. The new foundation column sections will then be added on top of the existing column sections. Typically, the added sections are full height, but under the leading edge of each pod the sections will be added in three pieces because of the second-level overhead. The jacking will occur from spreader beams on top of the new column sections with hydraulic jacks. The structure will be raised using four 57 mm rods at each foundation column. Again, the guide tees keep the trusses from shifting horizontally on the foundation columns. After the completion of jacking the connections to the vertical tower will be increased in height by one level. One design criterion was to minimize the number of foundation columns to minimize the number of jacking and leveling points. The jacking study determined that a minimum of one pod should be jacked at a time to minimize disruptions between the modules that make up a pod. Originally each module was fully self-supported with six foundation columns. 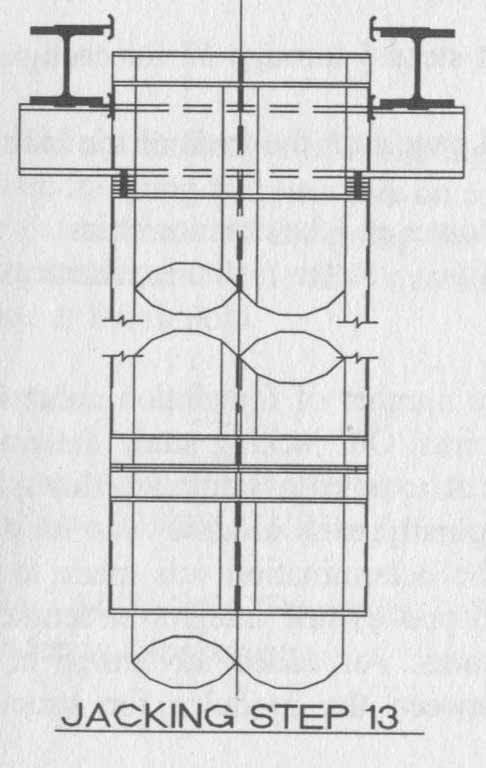 Once the determination was made to jack each pod as a unit it was possible to look at each pod as one integral structure and further reduce the number of foundation columns. An added advantage of this approach was eliminating deflection joints between the modules for structural, architectural, mechanical, and electrical functions. This saved both the additional initial expense and ongoing maintenance expense that would be necessary, as well as the operational problems of a possible vertical offset at the module joints. Hydraulic jacks were determined to be the appropriate jacks for both leveling and jacking. The same jacks could be used for both, with a few purchased initially for leveling and the rest needed for jacking purchased when the time comes. The jacks need to be operational at summer temperatures for the South Pole, -50ºC to -20ºC, and will require special low-temperature hydraulic fluids and special seals to contain the less-viscous fluids needed for colder temperatures. Purchasing the jacks in the future saves the initial expense, the need to store and maintain something that will not be use for 20 years or more, and the risk of having purchased something that may be obsolete when it is time to use it. The approach to jacking assumes a person at each jacking location, with everyone linked by radio so as to synchronize their efforts. The use of manifolded jacks is possible and could be more thoroughly evaluated at the time of the initial jacking. The vertical tower is a 22 m high building frame enclosed in an 11.3 m diameter corrugated aluminum shell. The frame is the stairs for access from the elevated station to the surface facilities, including cargo, and provides the lateral support for the equipment lift used to transfer materials to the elevated station from the surface facilities. The aluminum shell is buried in the snow. The building frame is independent of the shell and there is a 300 mm gap between the frame and the shell. This will allow the building frame to be plumbed as needed to maintain operation of the equipment lift without having to dig out and plumb the shell. The primary challenges of designing an elevated structure on top of the moving polar plateau, founding that structure on compacted snow that will settle 1 m over the life of the structure, and designing the structure to be jacked a full story height twice during its lifetime without disrupting operations there have been met in the design of the elevated station at the Amundsen-Scott South Pole Station. Dennis L. Berry, M.ASCE, is the president and Forrest T. Braun, M.ASCE, the vice president of BBFM Engineers in Anchorage, Alaska. Copyright © 2000 ASCE. All rights reserved.